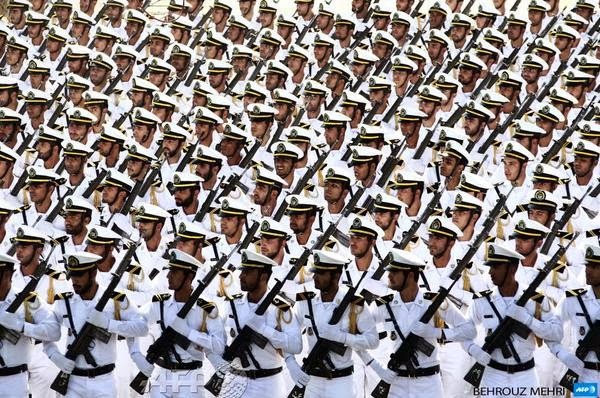 Iranian Navy troops marching during the annual military parade in Tehran during the Sacred Defense Week, marking the 34th anniversary of Iraqi invasion of Iran; 22 September 2014.
one of the most professional formations so far however being a mullah soldier's means not shaved and poorly organized comparing to real professional army formations.... very sad, this is the cream of the crop that Iran has to show off to the world. Having fancy uniforms is the opposite of a good fighting army. Iranian military is perhaps the most battle tested and formidable in the region. It is the morale, training, nationalism, motivation and unit cohesion that counts in battle or combat not Gucci uniforms or level of facial hair. I believe the Iranian military does not need to "show-off" anything to the world, its fighting history and 3000 year old illustrious history is more than enough for ample display of its prowess. It is time to move beyond the superficial. Can't a fighting force also have fancy ceremonial uniform? The Persians, 3,000 years ago, did! No first world military power resorts to such desperate measures as having its soldiers goose step down the street. Goose stepping soldiers is synonymous with third world ruthless oppressive dictatorships, like Kaddafis Libya or Saddam's Iraq or Assad's Syria ...and surprise... Khomeini's Iran! Take my word for it - when push comes to shove these low-grade troops will either surrender en masse or be wiped out! When the army parade's past Khameini the dictator they shout "My life in sacrifice for my leader!" and sing "Ay Islam" instead of "Ay Iran". So much for "nationalism". Mr. Uskowi, Unfortunately for the Persians all the fanciness of the day did not stop the Arab invasion of the DAESH/ISIL/ISIS equivalent of the day. Rather have a non-fancy but effective army than a fancy non-effective one sir. More like what we did Against the crazy Saddam and his Army in 1980's, for the first time in a long time Iran stopped and pushed back an invading Army. Thanks to their sacrifices today we do not need to get a visa from Baghdad to travel to Ahvaz. Wow so how you march in parade is an indicator of military effectiveness,who would`ve guessed it,so I guess if qaddafis forces hadnt goose stepped then they would`ve won against nato air power,right? !